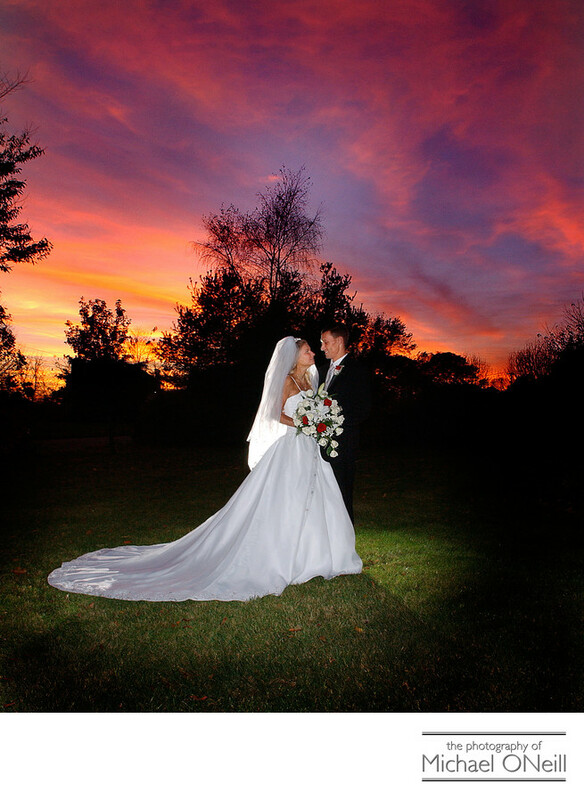 Another fabulous Long Island sunset wedding photograph. This is one I’ll never forget because it almost never happened. You see, this bride and groom got married at a church in Riverhead, New York. After their wedding ceremony we had a short photo session with their bridal party, got into the limousines and started heading east to their reception venue, Raphael Vineyard in Peconic, NY. The plan was to arrive at the winery in time to capture a beautiful sunset picture in the vineyard, but, as we were driving east I was watching the sun set in the rear view mirror of my car. I knew we were never going to make it to Raphael in time. The sky just kept getting more and more magnificent and I couldn’t stand it any longer. As I was passing an open field I slammed on my brakes, jumped from my car, stepped into the road and forced the following limousine to pull over. I rushed the bride and groom into the open field and captured this spectacular Long Island sunset just before it descended into darkness. I always tell my bridal clients "I can do anything for you except make time stand still". This sun was going to set whether or not we were at our desired destination or not. I’m glad I decided on a new destination. So were my clients.